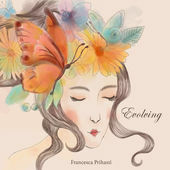 Indonesian born, now Sydney-based pianist, Francesca Prihasti has released her second album, featuring a quartet, recorded in New York. The seven tracks are all Prihasti originals, which she says express the story of a butterfly and its evolution from the egg, and caterpillar to adulthood. The opener, Summer Sky begins softly with a repetitive piano note suggested as signifying tiny butterfly eggs laid on leaves. As the inchoate piece continues Nic Vardanega’s guitar states the theme as Orlando Le Fleming’s bass and Rodney Green on drums join in unobtrusively and the piano embarks on flowing, lyrical improvisations, building to an ensemble crescendo. The bass, piano and guitar ostinatos at the start of The Circle serve to signify that all things move in cycles, and characteristically Prihasti’s sprightly solo glides with imaginative melodic ideas that are picked up and further expanded by the guitar’s spirited solo ahead of a concluding, cyclic return to the opening passages. Continuing the collection’s dreamily poetic atmosphere Safe Distance opens with a slow-moving piano and guitar theme that moves in an upward trajectory and introduces a thoughtful bass solo, while the title track establishes a tuneful melody interweaving piano and bass, soon joined by guitar moving into a pleasantly relaxed solo. For just over 24 years I have been a freelance writer, publishing in that time a wide variety of genres: news items, live concert reviews, travel articles, features, personality profiles, and CD and book reviews. I have written for various in-flight magazines, The Adelaide Review, The Republican, The Bulletin, The Australian, The Advertiser, The Melbourne Herald Sun and several regional newspapers. In 1994 I won a national travel-writing prize sponsored by The Australian newspaper, which led to my writing regularly for that paper. Since 2003 I have been jazz critic for The Advertiser and The Australian newspapers, on average contributing weekly to each paper. In 2005 I won a national Jazz Writing Competition sponsored by the Wangaratta Jazz Festival.